I can’t even express how lucky I am. I truly have the most amazing Valentine. He made my Valentine’s Day so special. After a long day at the office, I got home to the most beautifully set table. It was a night full of surprises for sure. Out of his bag of tricks, he pulled out dinner and all of the fixings. 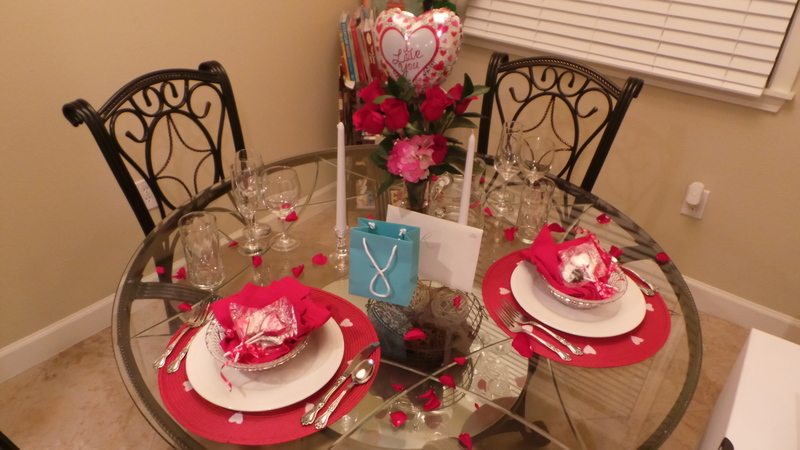 I could smell the chicken parmesan cooking in the oven as he placed the salad, warm rolls and dessert on the table. MMM…homemade chocolate covered strawberries-white chocolate covered strawberries. So delish! I’m skipping ahead of myself. We popped a bottle of bubbly, Kim Crawford sparkling wine, cheered and began dinner. The chicken was cooked perfectly. Everything was perfect. The best part…I didn’t have to do anything but relax.